Intensified studies made of folio 70r of the Codex Atlanticus resulted in a new interpretation, which led to the reconstruction of a machine that has never been seen before. 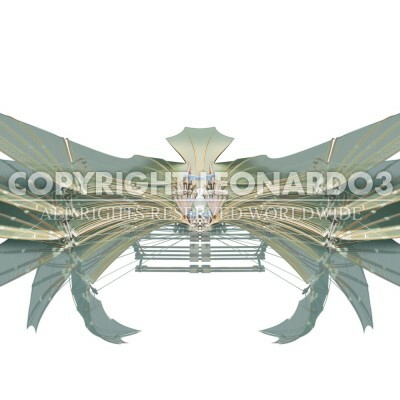 The wings of this flying machine comprise two sections, one internal and one external. The pilot would insert his head inside the central hole and put his feet on the lower pedals. The machine was supposed to have taken flight once launched from a slope. The pilot, whose shoulders would be strapped in, would flap the wings by pushing the pedals with his feet, thereby bending the wings downwards. At the same time, he would grip the two lower rods and pull them towards himself. The rods are connected to a pulley system that allows the wingtips to curve, bending them as they lower. All these kinetic movements aim to imitate those of a bird’s wings. Unlike many other machines meant for flight, it seems like Leonardo understood that for this design the wing span had to be broad in order to support human weight: almost 66 feet. The roped hand control serves not only to turn but also to bend the four sections of the wingtips at the same time. 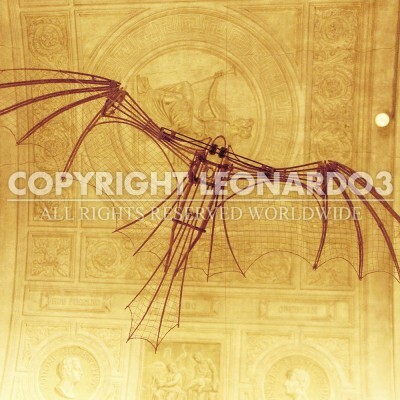 In conclusion, the original discovery made by the Leonardo3 research center on folio 70r led to the reconstruction of a flying machine that looks like a bat, with proportions that, approach those of a modern glider and a complex but efficient mechanical system with which to take advantage of every human movement in imitation of the dynamic structure of a winged creature. If this machine had ever been used as a glider, then perhaps Leonardo was able to fly!